Anya Krugovoy Silver. I Watched You Disappear. Louisiana State University Press, 2014. 73 pgs. $17.95. Like many readers, I found Anya Krugovoy Silver’s first collection, The Ninety-Third Name of God, published in 2010, absolutely stunning. 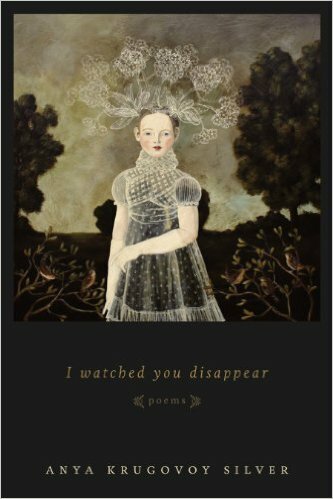 I waited impatiently for her next collection, I Watched You Disappear, and eagerly read it when it was published a few months ago. The two books share several themes, especially the speaker’s relationship with God and the effects of living with cancer. I Watched You Disappear is the more somber of the two, as the speaker’s community seems to absorb one death after another, and it more predominantly focuses on death and grief. This collection is more emotionally difficult because of death’s relentless hovering and so harder to read straight through, but the poems are just as accomplished and memorable as the ones in Silver’s first collection. I talk and talk and hear nothing back. According to this poem, prayer is what makes nothing happen. Not only does God fail to respond, but the speaker’s environment is so uniform from one minute to the next that she can’t interpret any event as a sign even if she’s determined to. like a beetle’s breath, this Amen. The speaker’s words leave as little evidence of their existence as the God whom the poem addresses, and in this way the speaker resembles her audience; she is an “image” that was called absent in line three. Her last word, “Amen,” concluding the prayer, reinforces the speaker’s status as creature rather than would-be creator, as understanding and accepting her identity in terms of the divine. that I should be doing something useful. the preacher says, it has entered our palaces. But I will not rush to push down my sash. Instead, I will turn the leaf of my book. lets it hover, in balance, then fall to its side. These poems call their readers to share in their reflection. They don’t demand rereading as more elusive poems sometimes do; instead they invite rereading through the hospitality of the tone and language. Of course, now, I am looking forward to Silver’s next book. But I am also content to wait, for the poems we have already in her first two collections welcome our lingering. To propose a guest review or submit a book for review consideration, send a message to lynndomina (at) gmail.com. This entry was posted in A Review A Week on August 9, 2015 by Lynn Domina.